Lutz Koepnick is the Gertrude Conaway Vanderbilt Professor of German, Cinema and Media Arts at Vanderbilt University in Nashville, where he also chairs the Department of German, Russian and East European Studies and serves as the director of the joint-Ph.D. program in Comparative Media Analysis and Practice (CMAP). He received a Joint-Ph.D. in 1994 in German Studies and Humanities from Stanford University. 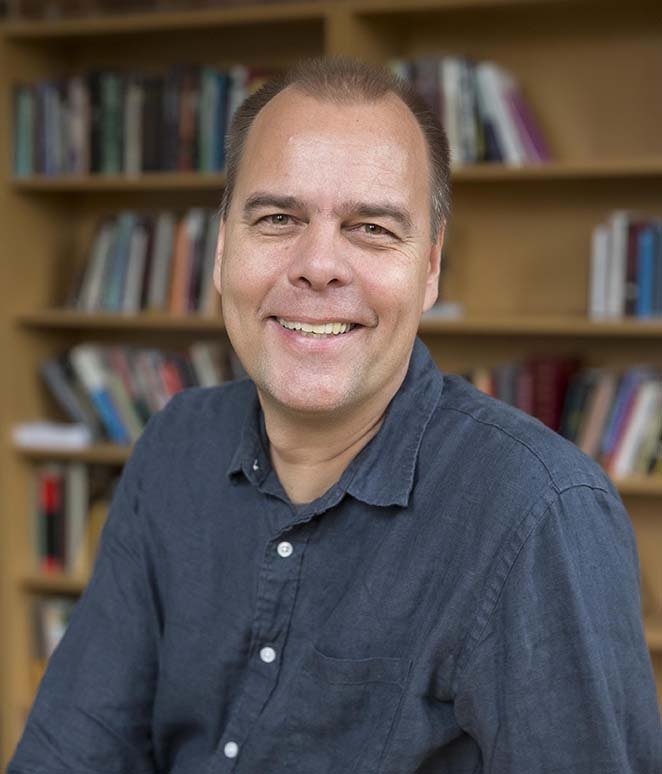 Koepnick has published widely on film, media theory, visual culture, new media aesthetic, and intellectual history from the nineteenth to the twenty-first century. He is the author of Michael Bay: World Cinema in the Age of Populism (2018); The Long Take: Art Cinema and the Wondrous (2017); On Slowness: Toward an Aesthetic of the Contemporary (2014); Framing Attention: Windows on Modern German Culture (2007); The Dark Mirror: German Cinema between Hitler and Hollywood (2002); Walter Benjamin and the Aesthetics of Power (1999); and of Nothungs Modernität: Wagners Ring und die Poesie der Politik im neunzehnten Jahrhundert (1994). Koepnick is the co-author of Windows | Interface (2007), [Grid ‹ › Matrix] (2006), and the co-editor of various anthologies on ambiguity in contemporary art and theory, the culture of neoliberalism, German cinema, sound culture, new media aesthetics, aesthetic theory, and questions of exile. His current book projects include a monograph on Werner Herzog’s film Fitzcarraldo and a book on the role of resonance in contemporary sound art. An impassioned argument for the cinematic long take as a compelling source of wonder and a unifying force of contemporary art. In The Long Take, Lutz Koepnick posits extended shot durations as a powerful medium for exploring different modes of perception and attention in our fast-paced world of mediated stimulations. Grounding his inquiry in the long takes of international filmmakers such as Béla Tarr, Tsai Ming-liang, Abbas Kiarostami, Apichatpong Weerasethakul, and Michael Haneke, Koepnick reveals how their films evoke wondrous experiences of surprise, disruption, enchantment, and reorientation. He proceeds to show how the long take has come to thrive in diverse artistic practices across different media platforms: from the work of photographer Hiroshi Sugimoto to the screen-based installations of Sophie Calle and Tacita Dean, from experimental work by Francis Alÿs and Janet Cardiff to durational images in contemporary video games. Deeply informed by film and media theory, yet written in a fluid and often poetic style, The Long Take goes far beyond recent writing about slow cinema. 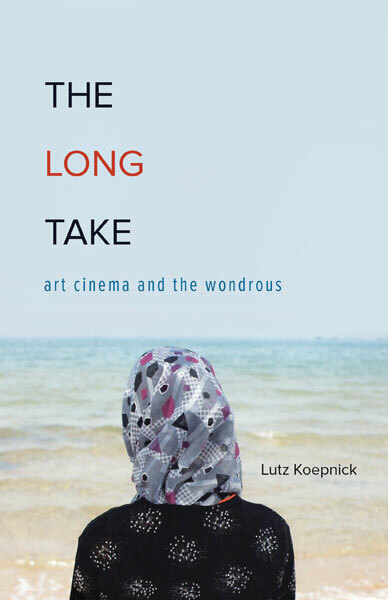 In Koepnick’s account, the long take serves as a critical hallmark of international art cinema in the twenty-first century. It invites viewers to probe the aesthetics of moving images and to recalibrate their sense of time. Long takes unlock windows toward the new and unexpected amid the ever-mounting pressures of 24/7 self-management. If size counts for anything, Michael Bay towers over his contemporaries. His summer-defining event films involve extraordinary production costs and churn enormous box office returns. His ability to mastermind breathtaking spectacles of action, mayhem, and special effects continually push the movie industry as much as the medium of film toward new frontiers. Lutz Koepnick engages the bigness of works like Armageddon and the Transformers movies to explore essential questions of contemporary filmmaking and culture. Combining close analysis and theoretical reflection, Koepnick shows how Bay’s films, knowingly or not, address profound issues about what it means to live in the late twentieth- and early twenty-first centuries. According to Koepnick’s astute readings, no one eager to understand the state of cinema today can ignore Bay’s work. Bay’s cinema of world-making and transnational reach not only exemplifies interlocking processes of cultural and economic globalization. It urges us to contemplate the future of moving images, of memory, matter, community, and experience, amid a time of rampant political populism and ever-accelerating technological change. 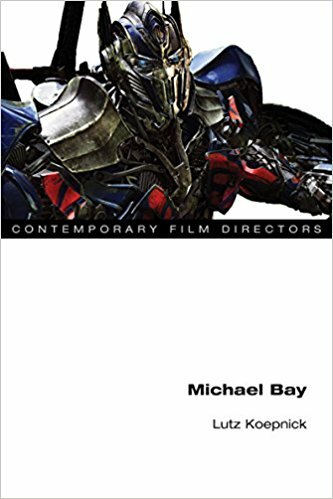 An eye-opening look at one of Hollywood’s most polarizing directors, Michael Bay illuminates what energizes the films of this cinematic and cultural force. Speed is an obvious facet of contemporary society, whereas slowness has often been dismissed as conservative and antimodern. 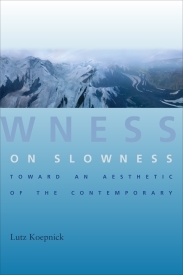 Challenging a long tradition of thought, Lutz Koepnick instead proposes we understand slowness as a strategy of the contemporary—a decidedly modern practice that gazes firmly at and into the present’s velocity. As he engages with late twentieth- and early twenty-first-century art, photography, video, film, and literature, Koepnick explores slowness as a critical medium to intensify our temporal and spatial experiences. Slowness helps us register the multiple layers of time, history, and motion that constitute our present. It offers a timely (and untimely) mode of aesthetic perception and representation that emphasizes the openness of the future and undermines any conception of the present as a mere replay of the past. Discussing the photography and art of Janet Cardiff, Olafur Eliasson, Hiroshi Sugimoto, and Michael Wesely; the films of Peter Weir and Tom Tykwer; the video installations of Douglas Gordon, Willie Doherty, and Bill Viola; and the fiction of Don DeLillo, Koepnick shows how slowness can carve out spaces within processes of acceleration that allow us to reflect on alternate temporalities and durations.